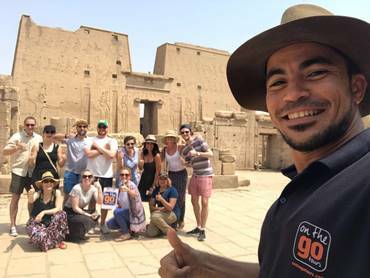 November 2018 – On The Go Tours (OTG) recently hosted a group of agents to experience their King Tutankhamun 9 days Tour in Egypt. While Egypt has experienced its hardships over the last decade, travel interest has been on the rise since 2015 once the travel warnings were lifted. More recently, over 2017-18, OTG saw a growth of 102% on group tours to Egypt and an increase of 62% towards tailor made holidays. As OTG’s first destination back in 1998, Egypt is considered their specialist destination. All guides have degrees in Egyptology and on average around nine years’ experience working with the company. The group included reps from NSW and ACT Flight Centre and was hosted by OTG’s Paola Bamonte along with their local guide Mahmoud Ramadan. Starting in Cairo, over the nine-day itinerary the group visited the famous pyramids, the Sphinx at Giza Plateau and the pyramids of Cheops. Other highlights included a guided tour travelling north to 4000-year-old Luxor, home of the legendary Temple of Karnak and Valley of the Kings, and a Nile felecca cruise. For more information or to book, please visit www.onthegotours.com or call +1 300 855 684.